Beginning in the early grades, students at Palouse Prairie begin to hone their research and communication skills. 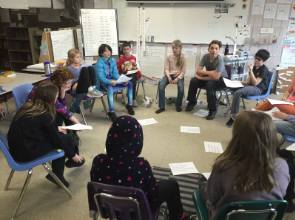 Throughout their journey at Palouse Prairie, students have the opportunity to share their learning and voices in a public and authentic way. Students recognize the power of clear communication and the necessity of synthesizing their learning in order to make and advocate for action on various issues. Through the use of the quality work protocol, we noticed that we had a strength in written products and a need to share their learning more often through spoken word. Speaking and listening standards are intentionally taught and practiced in the context of expeditions rather than in isolation. 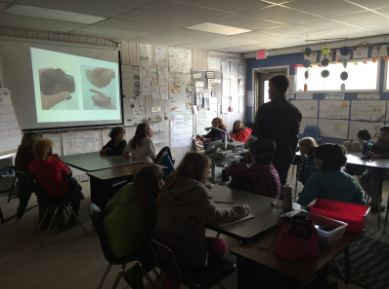 PPCS students see the value in practicing, developing, and becoming proficient communicators. Palouse Prairie School expedition final products are intentionally designed to give students voice to discuss the issues that relate to their expedition. While many of our expeditions integrate art and writing, we have deliberately worked to ensure that our students have multiple opportunities across their PPCS career to synthesize their learning in preparation for publicly speaking to authentic audiences. Students’ work grows over time in complexity, authenticity, and craftsmanship as they are enlightened and more involved with issues in their community. They are able to speak passionately and elaborate on issues with the intention of using their voice to make a difference in the community or world. Even in the youngest grades, students are using their voice to create change. 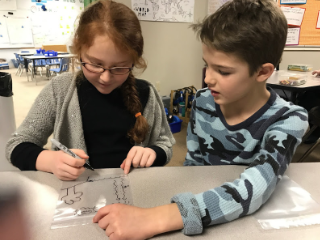 In first and second grade, students embark on an expedition related to Moscow, Idaho’s depleting aquifer. 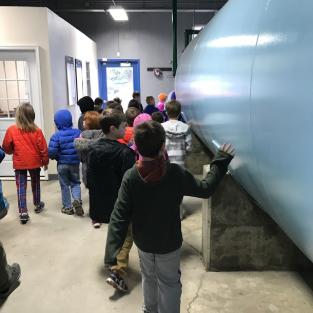 By learning about the water cycle and researching the needs of water in our local community, students begin to understand how Moscow citizens can make small behavior changes to help sustain our local water source. Students creating models of the water cycle. Students at the city of Moscow Water Department, learning how the community gets water. In a previous year, students synthesized their learning and created public service announcements (PSAs) for the local radio station. 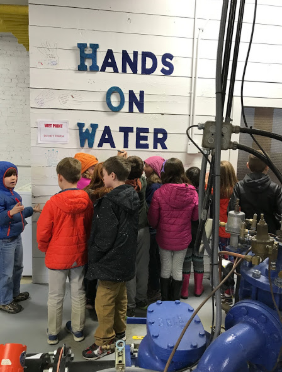 Students used the information collected from fieldwork at the City Water Department, collaboration with experts and informational texts and created the PSAs. Students spent time researching their individual water footprint, the community consumption and how the local city government is advocating for water conservation. Using what they learned, students formed small groups and created a PSA about a specific way to conserve water. 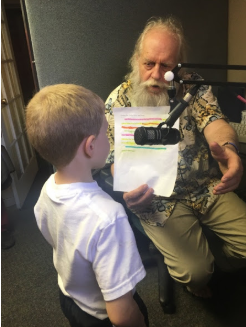 Through collaboration students drafted, practiced, and, finally, went to the radio station to record and to share with their community how to conserve water and help save the Moscow Aquifer. Students collaborating to create their PSA. At the radio station recording PSAs with their expert helping them make the best recording possible. During fifth grade’s spring expedition, The 6th Mass Extinction, students studied biodiversity, threats to biodiversity, and ways people can help the environment. During case study two and three, students dove deep into a particular biome in groups of three. They studied and wrote about the characteristics of their biome, the importance of their biome, and adaptations that help animals and plants thrive in their biome. They then researched threats to their biome, wrote about them, and created a graphic-novel type panel that illustrated on of their threats. For example, the group members of open ocean each researched and illustrated one of the three threats – overfishing, pollution, and ocean acidification. Their writing and artwork were put together in a comprehensive poster about their biome so that other crew members could learn from each biome expert group. 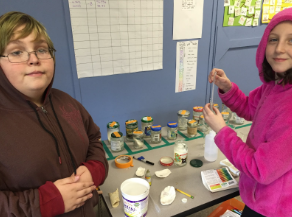 Students researching ocean acidification by conducting experiments. A science talk to discuss: Why are natural places and biodiversity important? How are humans directly and indirectly impacting the environment? How are people helping and how can we be a part of the change? Finally, students chose an animal or plant from their biome to represent. They worked to individually watercolor their animal and worked collaboratively to write a 3-4 voice poem that brought light to their biome and the animals and/or plants within their biome. Group members synthesized all the information they had gathered from the weeks of working on their biome. Their artwork and spoken word poetry came together in a whole class presentation at a local theater. Their animals were projected on a screen behind them individually, and then all together as each biome group used their voices to show solidarity with the animals and plants they were representing. Expert David Roon talking about his work as a research conservationist and artist. Please refer to Models of Excellence to see the final products of this amazing expedition. The Roots of Conflict is an 8th grade expedition that examines the Israeli-Palestinian conflict from multiple perspectives. The first case study traced the historical roots of the conflict up to modern times. During this process, students developed an understanding of the context and outcomes of the first world war, British colonialism in Palestine, the 1932 election in Germany, the impact of the Holocaust and WWII, the impacts of the 1947 Partition Plan and 1948 War, the 1967 War, both Intifadas, and the spectrum of solutions proposed by both Israeli and Palestinian leadership. In addition, each historical event was presented and analyzed from multiple perspectives. The second case study focused on the analysis and synthesis of spoken word poetry. Students research opportunities to ensure they can be of service to the local community. To culminate this expedition, students collaborated to craft a high-quality two-voice, spoken word piece from a perspective in the Israeli-Palestinian conflict to perform for the Washington State University Roots of Conflict course series. These pieces of work took place in both modern and historical times. The voices in each poem were connected, both to each other, and to the conflict between Palestine and Israel. In addition, these voices demonstrated both a similarity and difference in perspective. This work was done in three phases. Phase one determined the perspectives and time period of each specific piece and ensured that all performances offered a different part of this story. Phase two involved writing each piece. Phase three involved memorizing pieces and getting to a high-quality performance level. Students at PPCS just don’t restate important points learned; they synthesize their learning by combining ideas and creating a complex piece of writing with original insights and perspectives. 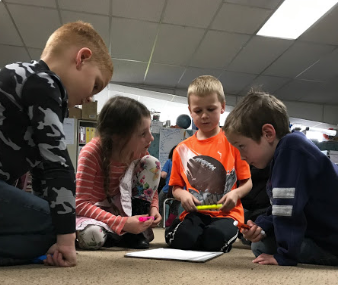 These pieces of writing are strengthened through a revision process, which also includes receiving feedback from experts, teachers, and peers. Students learn how to and continually practice giving constructive feedback to support each other in refining their work. Students communicate these final pieces of work to a public authentic audience to raise awareness and promote positive change.